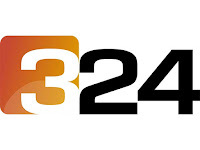 3/24 TV is a 24 hour news channel operated by Televisió de Catalunya (TVC) in Catalonia, Spain. It began broadcasting in 2003. 3/24 also shares programs with sister channel TV3. It broadcasts TV3 daily news programs, Telenotícies, and morning program.